An avid artist, I won my first art contest at 8 years old. My mother had entered a drawing I had done of an old man into an adult art contest. I won first place, and when I went up to get my ribbon the judges did not believe this little kid had drawn the picture because it was too adult-like. 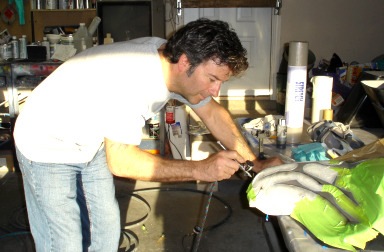 I started airbrushing in 2006 to paint my own bike. Other people saw my bike and started asking me to do their helmets and bikes. With help from Doc Cyber and friends like Steve Driscoll, my artwork has really become something for me to be very proud of. If my wife (my toughest critic) doesn't like it, it does not leave my shop. I use only the best paints and always apply at least four coats of clear before a complete wet sand and polish job for a mirror-like finish.